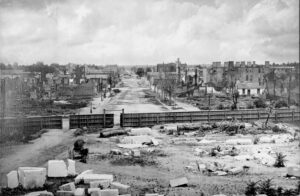 The Civil War was incredibly destructive–750,000 dead, according to the latest revision of the numbers, meaning that more Americans died in the Civil War than in all other American wars combined. But it also resulted in untold numbers of wounded and maimed. Of all the operations performed in the Civil War, 75% or roughly 60,000, were amputations. Also, for the very first time, American cities stood in ruins. Atlanta; Columbia and Charleston in South Carolina; and Petersburg, Fredericksburg, and Richmond in Virginia looked like the standing stones of some long-lost civilization. Americans no longer had to travel to Europe to meditate upon days gone by. Even forests, in some places, were clear cut. 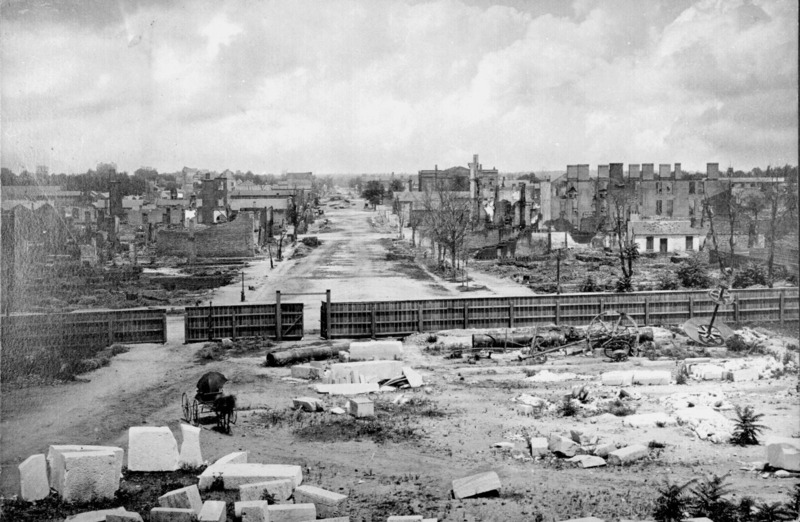 But…not all of those cities were ruined; only a portion of Richmond was destroyed for example, and many colonial-era buildings survive in Fredericksburg. The little town of Gettysburg had the largest battle in North American history swirl around it for three days, and yet it remains largely in one piece, to the delight of 21st century tourists. Some forest were reduced to stumps, but others in the same neighborhood exist to this day. How to square this circle? How could the Civil War be destructive, and yet often remembered as even more destructive? How, too, did traces of that ruin so quickly disappear? And what were the longest-lasting memorials to that ruin? Answering these and other questions is the task of Megan Kate Nelson in her fantastic book Ruin Nation: Destruction and the American Civil War. Using a variety of sources, she picks apart the different ways ruin was visited by Americans upon each other, their cities, and their landscape: on cities, the environment, and on their bodies. Enjoy the podcast, and buy the book!